Our family just finished watching the most incredible movie tonight. Netflix, our movie rental place delivered it to our mailbox today. All of us have been waiting for this one to arrive so we plopped it right in. Sorry for the commercial. 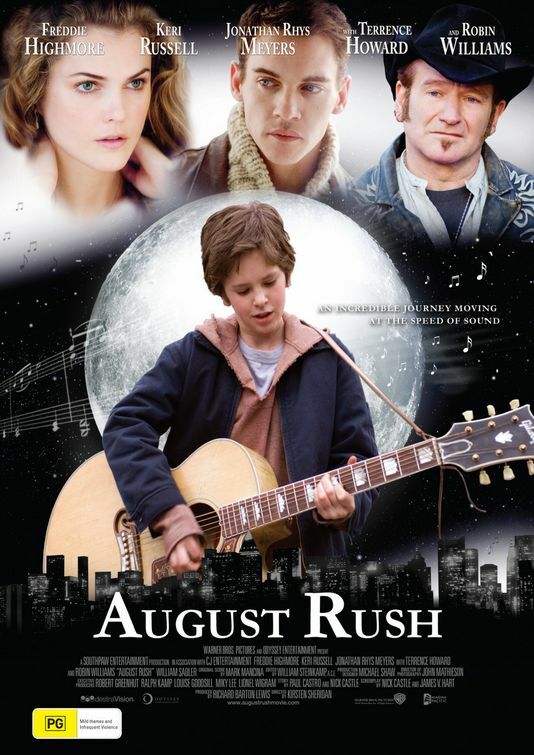 The movie is “August Rush“. It is not my typical genre, but it is going to be one of my all time favorites. Usually the movies I like have to be filled with adrenaline and good dose of testosterone. But this movie appealed dramatically to my passion for music. If you haven’t seen it, I would definitely recommend. It is rated PG and would appeal to all family members. It is sure to be in our DVD library soon. I have provided one my favorite scenes for the movie. My favorite scene is the ending but I won’t spoil that for you. Check out the short clip below. Yep, this was a great movie. Gave me another reason to love Keri Russell as an actress (Waitress) It’s too bad Robin Williams is in it, but he plays the part of the villan so convincingly you can’t help but think it is art imitating life….. I love that one review called the plot “schmaltzy” and “unrealistic”. Guess the days of ET, Goonies, and Gremlins are gone forever!! Thanks y’all. (it’s the Southern in me) I have since found the soundtrack music and it is even better. It could be coming in a music review soon. That was a great movie..
august rush is a great movie. right now im sorry that i didnt see him before.but is a pleasure. if that story is a real one is truly the greatest.